The blood never dies. The blood never forgets. Sabé. Do you know that name? Maybe you do if you’re a die-hard Star Wars fan. I had to look up her name, but I remember her character well. Sabé was Queen Padmé Amidala’s handmaiden and body double. She swore allegiance to the queen and vowed to protect her no matter the threat. Not only did she look like her queen, but she also loved and admired her and willingly served her. 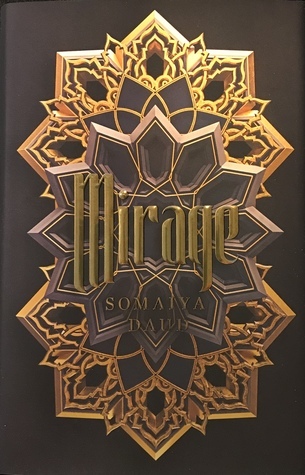 Why am I talking about Star Wars – a classic Sci-Fi story when I’m supposed to be reviewing Somaiya Daud’s new debut YA novel, Mirage? Well, because they have several things in common: body doubles, droids, TONS of politics, and very determined rebels. Amani, a common farmer’s daughter, has a general sense of the political unrest around her, her loving family, and the villagers she loves. After all, they have lived under alien rule for all of her life. But it is only after she is kidnapped by royal droids and forced to become a body double for the evil Princess Maram that she becomes truly aware of the tenuous plight of her people and their planet. Vathek imperial rule has attempted to subdue everyone, but there are some that are willing to fight it until the end — will Amani be among them? So the Vathek are the bad guys. They ruined the atmosphere on their own planet, now they’re invading and taking over everywhere else – planets, moons, everywhere. Bullies. They forced their rule, language, and beliefs on everyone in their star system and their main focus now is crushing any opposition to their empire. As with any planetary takeover, there’s a buttload of politics in this story: Alliances, allegiances, appropriation, and autocracy. But there are also lots of fantasy elements, especially in terms of the native people’s belief systems and lore. The story is brimming with symbolism and traditions that marked the rich history of the people before Vath occupation. But that history is slowly fading from minds and hearts as Vathek ways permeate all nuances of life. Amani’s capture only emphasizes this: no one has their own free will – you live or die all at the whim of the Vathek King Mathis. Which brings us back to Amani. She is kidnapped (against her will), forced to live in seclusion in the royal palace (against her will), forced to alter her appearance and personality (against her will) all to serve a cruel princess who loathes and despises her. So, yeah, the opposite of Sabé in almost every sense. So why the comparison? Because Sabé was a handmaiden, but she made herself indispensable, earned respect, and became powerful even in her service to her queen. Amani will need to learn those same traits in order to survive as Maram’s double. But could there be some kind of humanity left in Maram? Amani plans to find out. I wanted something else, something more tangible and immediate. I wanted the world. Somaiya Daud’s debut novel blends several lit genres into a fast YA read that will leave fans wanting more. The book is packed with rich sci-fi elements including crafty technology and space travel. You won’t find faeries or trolls here, but there are direct references to mythical and supernatural beings and animals alike. And for readers who like a side of romance with their YA, Daud has you covered there too with a sticky little love triangle that almost seems inevitable even from early on. You are not responsible for the cruelty of your masters. Although the “cliffhanger” fell a bit flat for me, the draw towards book #2 is clear. Budding world-building and steady character development are certain lures for readers, even if constant language immersion and inconsistent action are a bit draining (hello, Kushaila/Vathekaar translator app, anyone? If you’ve ever tried to learn Quenya or Dothraki, you’ll love this book!). The primary draw is all the rich, non-traditional characterization and imagery. There’s lots of color and texture here, and as we all know, variety is the spice of life! My face changed, my body broken. And I would survive and endure. I would find my way back home. Read an excerpt of Mirage here. Like most writers, Somaiya Daud started writing when she was young and never really stopped. Her love of all things books propelled her to get a degree in English literature (specializing in the medieval and early modern), and while she worked on her Master’s degree she doubled as a bookseller at Politics and Prose in their children’s department. In 2014 she pursued a doctoral degree in English literature. Now she’s preparing to write a dissertation on Victorians, rocks, race, and the environment. Mirage is her debut.